Amanda Weidhuner, a junior in Plant and Soil Science, grew up on a farm in Central Illinois and has always had a fondness for plants. As a freshman at SIUC, she volunteered in the Agricultural Teaching Greenhouse until her sophomore year and then began working in the SIUC Plant Pathology Lab. She became intrigued by the research side of plant production and wrote a research proposal with the help of Dr. Alan Walters, Professor of Vegetable Science and Breeding, to explore the options available in sustainable vegetable production. 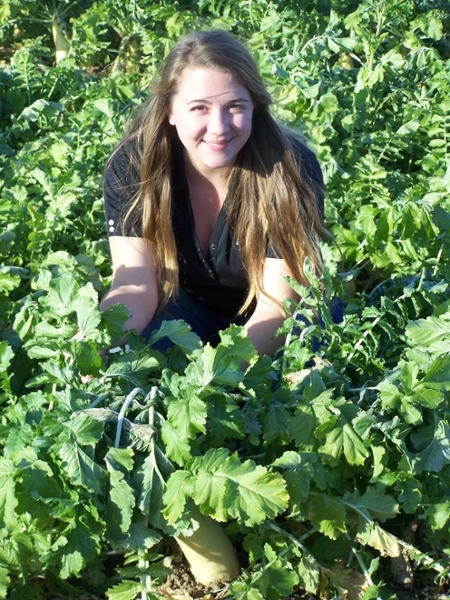 She was awarded a Research-Enriched Academic Challenge (REACH) Award for Sustainable Fertility Management in Organic Broccoli Using Cover Crops. The project is ongoing at the Student Organic Farm at the SIUC Sustainability Center. She continues to manage the tillage radish and crimson clover cover crops before planting spring broccoli in the spring. Both Dr. Walters and his researcher, April Vigardt, are providing guidance. 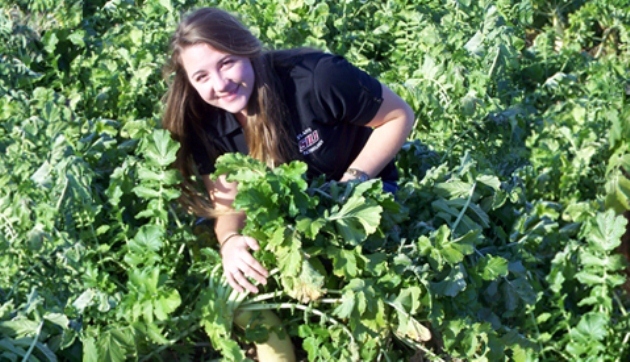 This experience has provided Amanda with new knowledge and skill sets, including proposal writing, experimental design, data collection, crop management, and data analysis. She will be presenting her research findings at the SIUC 2014 Undergraduate Research Forum and St. Louis Area Undergraduate Research Symposium (StLAURS).